Jaisalmer, the golden city of Rajasthan, is blanketed with never ending stretches of the majestic Thar Desert. It looks like an incredible yellow stone masterpiece when seen from the heavens. The city has a strong historical significance which shows in its wonderful list of ancient artistic monuments. Visit here to get drenched by the slice of royal heritage. 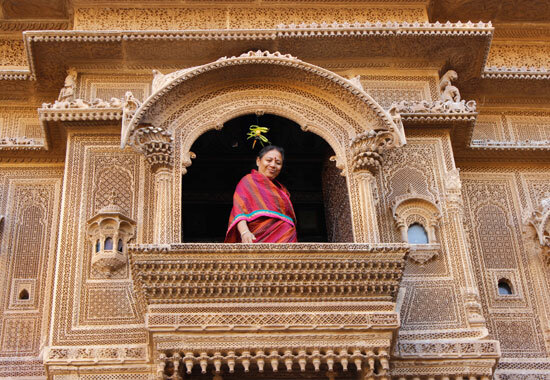 Locals of Jaisalmer are deeply rooted to their cultures and flaunt a vibrant Rajasthani demeanor. 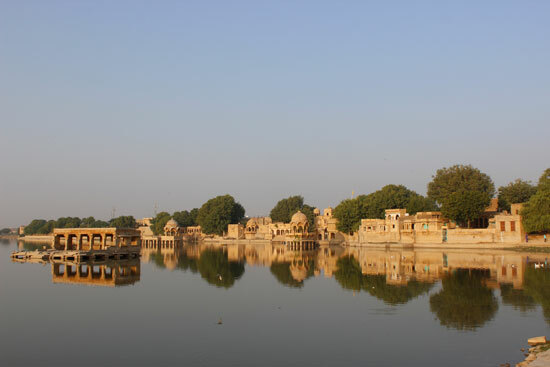 Jaisalmer is named after Maharaj Rawal Jaisal who established this grand city in the 12th century. Jaisalmer was founded in 1156 AD by Maharawal Jaisal Singh, a Rajput ruler. Jaisalmer literally means “the Hill Fort of Jaisal“. It has earned the title of the “Golden City of India” due to the sprawling Thar Desert. Most of the buildings here are made of yellow sandstone which shines bright when the rays of sun fall on them. Most of the city is arid desert. As you walk through the roads of Jaisalmer, you will be greeted by smiling locals dressed in colorful Rajasthani attires and ornaments. Most of the men here carry rainbow color turbans and big moustache which is their pride. The city of Jaisalmer is dotted with some of the most extravagant forts and palaces sharing insights about the richness of India’s history. These ancient monuments are great fascination for photographers looking for spectacular architectural wonders. Jaisalmer Fort or Golden Fort or Sonar Kila is counted among the biggest forts on the planet. The fort is one of the few “living forts” in the world. It was raised in 1156 AD and shines like a golden star during day time. Its walls are massive and it houses four massive gateways, Raj Mahal palace, Jain Temples, Laxminath temple and many Merchant Havelis. This is one of the largest havelis in Rajasthan. It is actually a cluster of five small havelis. The construction work of Patwon ki Haveli was initiated by Guman Chand Patwa and was later completed by his sons over the period of 55 years. Visit here and explore the fine wall paintings, stunning jharokhas, archways and many gateways displayed. This was built by Salim Singh around 300 years ago. The haveli features an arched roof which looks like a dancing peacock. 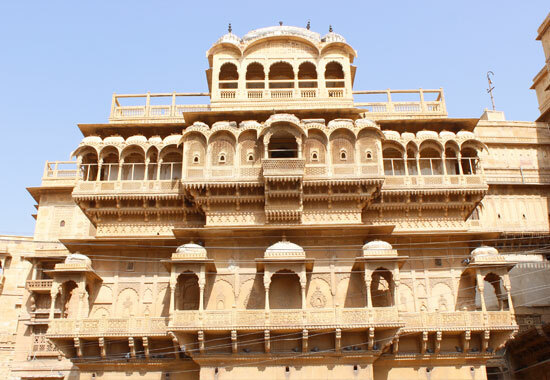 Its distinctive architecture is worth exploring and it remains a must visit sight in Jaisalmer. This is a grand garden complex standing on the top of a small hill. You enter into the garden from the bottom of the hill. 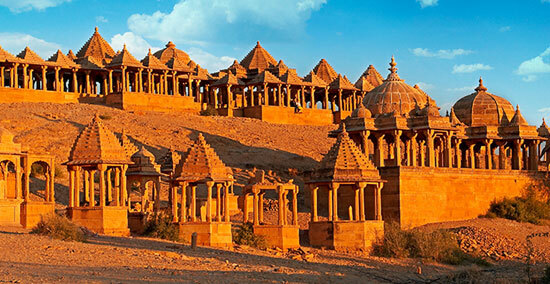 Here you will spot a set of royal cenotaphs honoring Maharajas of Jaisalmer. It stands inside the regal Jaisalmer Fort. In the past it was a royal residence but was later transformed into a heritage centre and museum. Visit here and fall in love with its huge collection of artifacts showcasing the richness of cultures and heritage of Jaisalmer. 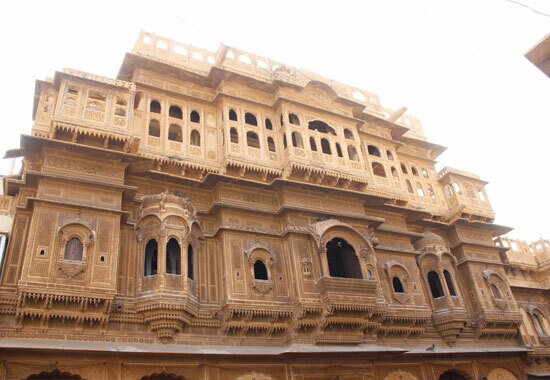 Jaisalmer fort presents a beautiful mélange of Muslim and Rajput architecture styles. Jaisalmer has a lot more than just forts and palaces. The city has rich religious roots which show in the temples dotted here. 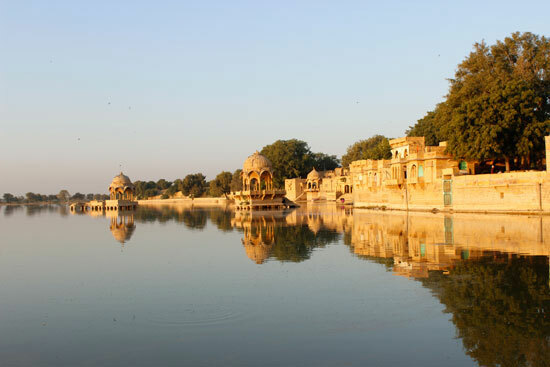 Many lakes also adorn the city and give a perfect backdrop to the ancient wonders. 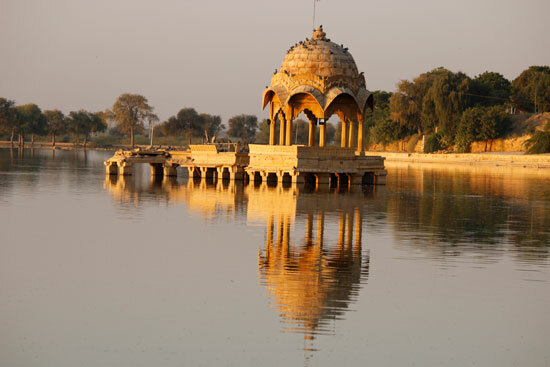 This lake is also known as Gadisar Lake or Gadsisar lake belongs to the 14th century and remains a popular tourist attraction in Jaisalmer. The lake surrounds many temples, including the most popular Krishna Temple. If you are visiting here during winter months, you will be treated with views of migratory birds. Boating is available here. The lake also hosts the famous Ganguar Festival when Rajasthani women flock around the lake to celebrate this event. 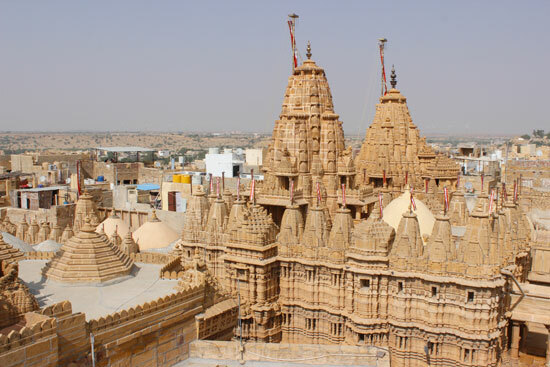 These Jain temples act as important caretakers of local cultures and religions. They were raised in the 12th century and stands inside the main Jaisalmer Fort campus. They attract visitors with their detailed architectural work. These temples are dedicated to Jain Tirthankars and welcome many Jain pilgrims. This is a rustic village which is mostly in ruins today. It rests in the outskirts of the city and belongs to the 13th century. Once it consisted of 84 villages but later nearby 83 villages vanished from here. The village still looks fascinating and houses temples and step wells. 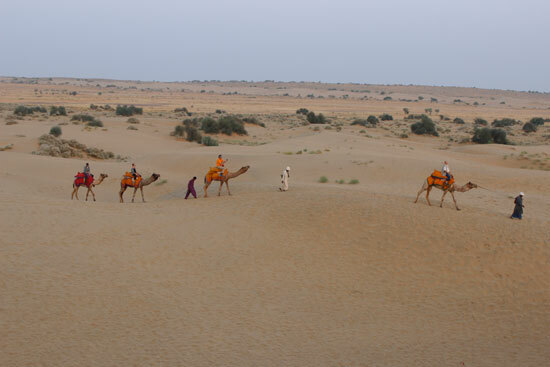 Thar Desert is the world’s 18th largest desert, and the world’s 9th largest subtropical desert. It sprawls over more than 200,000 kms of land. Jaisalmer is a magical city that showers you with some of the most unmatched experiences. This is real Rajasthan that lets you take a plunge into the local cultures, art and history in the most beautiful way. 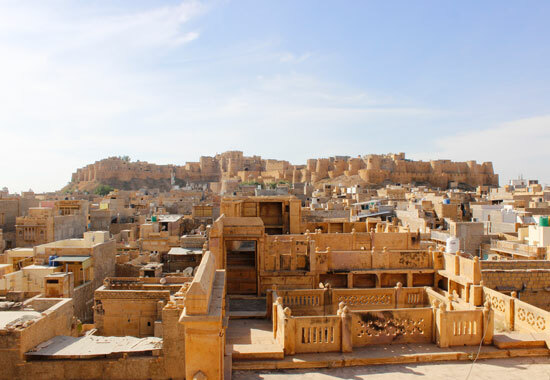 From adventure activities to camping and from traditional dance forms to tasting local cuisines – there are so many interesting things to do in Jaisalmer. 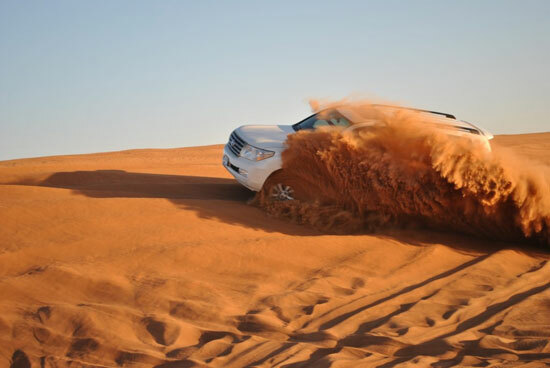 A dune bashing experience in Jaisalmer bestows seamless pleasure to those seeking thrill. The Sam Sand Dunes amidst Thar Desert is a dream of many adventure lovers that lets them ride the rising and falling sand dunes on a racing jeep. 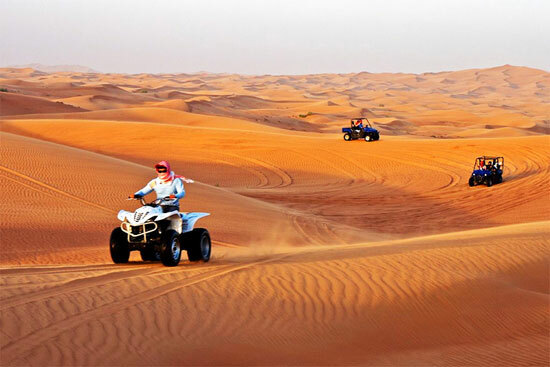 Enjoy a Quad Biking Tour inside the jungle and fall in love with the landscapes around you. The activity is available for both adults and kids. No holiday to Jaisalmer can ever end without indulging in a charismatic desert safari. Ride on a camel amidst shimmering desert sands and spot the most beautiful sunset views. Also relish the pleasure of staying in luxury tents. 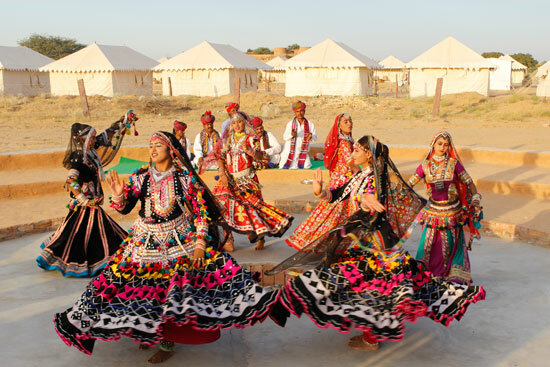 Most of these tents organize Rajasthani dance performances along with a traditional Rajasthani dinner. Camping is available in Jaisalmer in all budgets. The Jaisalmer Desert Festival is an extravagant treat for the devotees of cultures and traditions. The festival is celebrated in the month of February. It is the time when the golden desert sands come alive with vivid colors. Witness local dance and musical performances apart from many exciting competitions like camel polo, Tug-of-war, turban tying, longest moustache competition, etc. Do not miss a romantic boat ride experience on Gadisar Lake to catch the most beautiful sunset of your life. The ride takes you around the lake that lets you explore the splendid temples dotted in the middle of the lake. 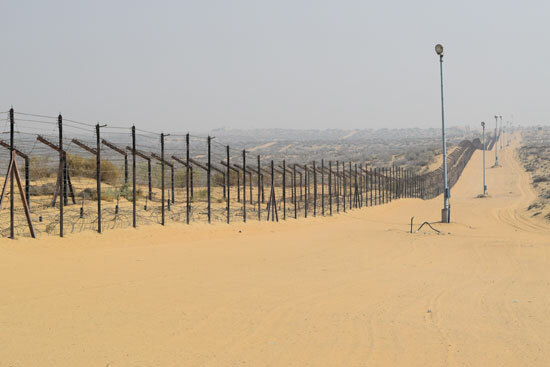 Enjoy a glimpse of the Indo-Pak Border which surely gives goose bumps to all. See the international borderline between India and Pakistan. Prior documentations and permissions are required to visit here. Enjoy the beauty of the desert like a bird by partaking in parasailing and paramotoring. 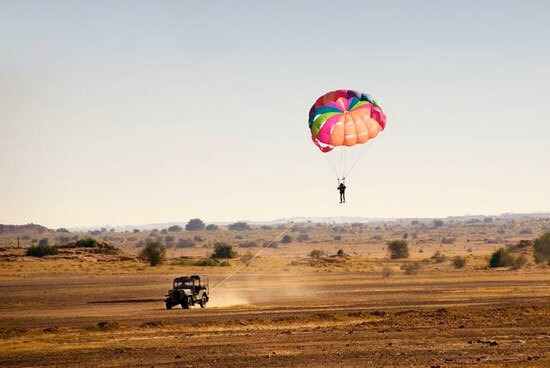 These activities are organized right in the middle of the desert to let you relish fascinating views as you fly high. Never miss sunrise at historical Gadisar Lake or Gadsisar Lake. The morning light and golden color monuments surrounding the lake will make this a perfect place for photography. 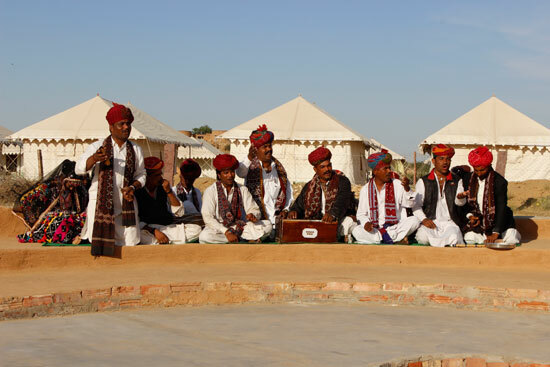 Mangniyar or Mangniar is Muslim musician community singing Sufi and folk songs for past many generations for their Hindu hosts and their villages are around Jaisalmer town. A live performance by these Rajasthani Folk musicians will certainly elevate you. Kalbeliya is a snake charmer community famous for their unique dance style and colorful dresses. 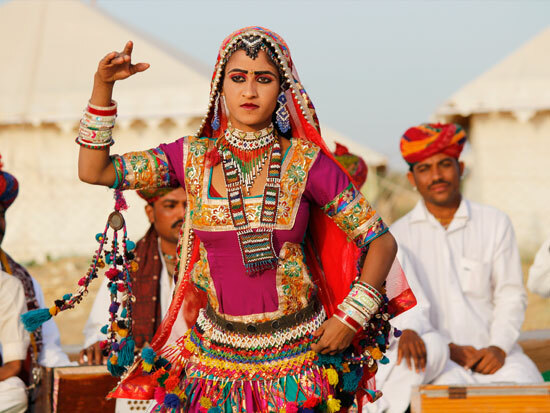 A dance performance by beautiful Kalbeliya girls along with live folk music is a must do activity while staying in Golden City Jaisalmer. 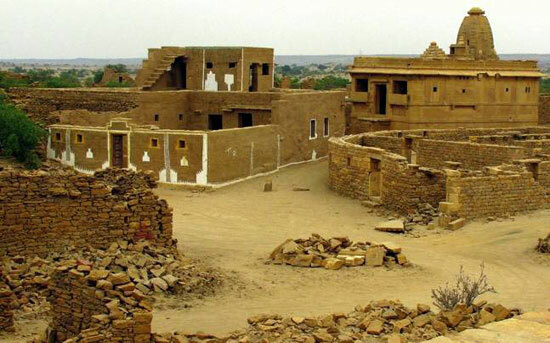 There are many deserted villages in Jaisalmer which are considered as haunted. Shopping in Jaisalmer is all about mingling with the locals, understanding their deep cultures, soaking into their traditions and bagging beautiful local handicrafts. Jaisalmer is blessed with some exciting local markets showcasing all the hues of Rajasthan. Sadar Bazaar remains the best street market known for selling anything and everything. From here you can buy paintings, carpets, handicrafts, jewelry, etc. If you are looking some antique souvenirs, then Bhatia Bazaar should be your spot. Sonaron ka Baas is another colorful market of Jaisalmer from where you can buy precious stones apart from funky ornaments. Other prominent markets of the city are Pansari Bazaar and Manas Chowk. If you are visiting Jaisalmer during summer months, do carry a sun block, hat and sunglasses. Sightseeing in Jaisalmer can be tiring, thus, always wear comfortable shoes. Hire a guide to explore the city like a local. Always take prior permission before clicking pictures while visiting heritage monuments. Months from October to March are ideal to plan a holiday to Jaisalmer to savor all the hues of this culturally rich city without being burnt by the summer heat. This is also a good time for enjoying desert safari or Camel Safari and to partake in the Jaisalmer Desert festival falling in the month of February. Jaisalmer remains one of the largest wind farms in India. Jaisalmer airport is well connected with flights from Delhi, Jaipur and Jodhpur. Jaisalmer has a good rail network which connects the city with cities like Delhi, Jodhpur, Jaipur and others. Many state run and private buses are available from Jodhpur and Udaipur to reach Jaisalmer.